Innokin has had an interesting record. Don’t get me wrong most of the advanced personal vaporizers they’ve put out have been great. There’s just been some oddball design choices like the Cool Fire II “grenade” and the huge iTaste 134 “mini-gun.” Fortunately, there’s a solution to the latter, in the iTaste 134 Mini. It even comes with a very competent new tank. In this iTaste 134 Mini and iClear x.1 review we’ll take a deeper dive into these new products. Due to the inclusion of the iClear X.1 with the 134 mini, I’m probably going to skimp just a bit on the design details of the 134. 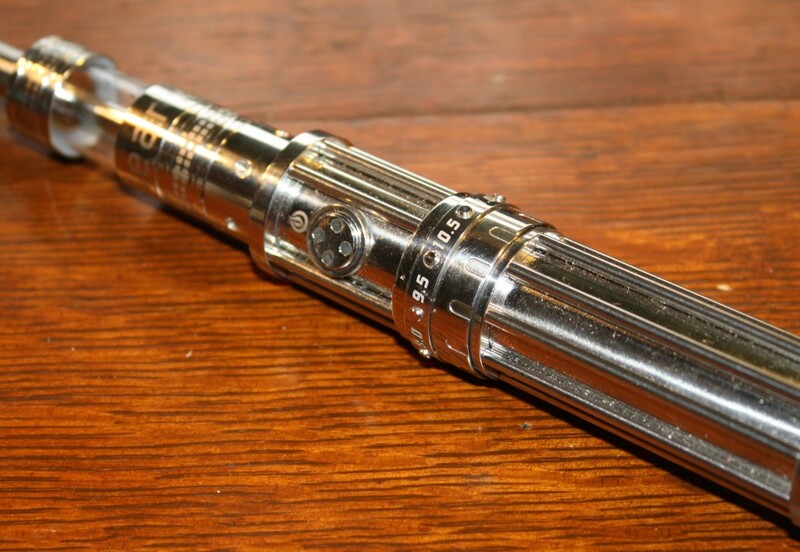 It is, after all, basically a smaller version of the iTaste 134 which I reviewed previously. If you want to get more in-depth with that model, scope out that review. Don’t worry, I know you probably didn’t go read that other review, so I’ll give you the quick tour of the 134, particularly the differences between the big and little versions. 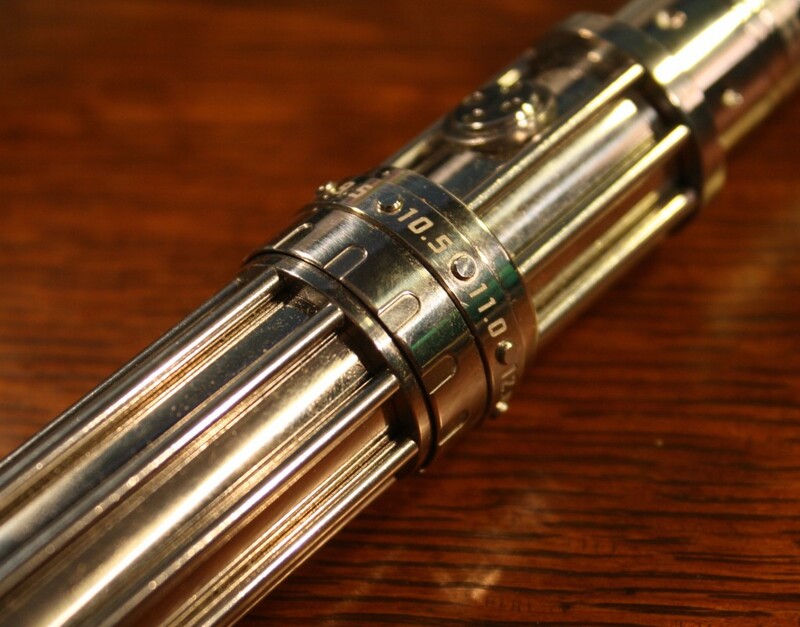 The overall design concept of the 134 is a standard tube-style APV surrounded by an outer cage comprising of a series of metal bars going around the diameter of the tube. While they might offer some protection to the device in a drop, my contact at Innokin confessed they’re mostly there because they look cool. One of the big complaints I had with the original version was the addition of the bars just made the thing unwieldy to grab. The Mini is smaller around as well as in height making it much easier to use and just hold in general. What hasn’t changed is the innovative dial wheel wattage selector. Despite its low-tech nature, I just really like being able to turn the dial to my desired setting. It’s sort of like an eGo Twist only much more elegant with a precision feel to it. Here’s a trick the big model doesn’t have: interchangeable tubes. You can configure the Mini to work with either an 18350 battery or an 18490 model by swapping in a larger or smaller tube. Unlike similar designs, this one has an interesting mechanism to connect the tube to the main part of the device. Instead of screwing the two pieces of the body together, you press the bottom into the top after lining up a set of pins. Then there’s a locking ring that you tighten to keep everything together. It is a little complicated in my view, but that’s probably how they keep the outside bars lined up correctly. Other than those differences, the two models are very similar with a stainless steel body and a very solid feeling. A removable top cap conceals a full eGo connector. Both also have a metal fire button with a set of LEDs that illuminate in the traditional Innokin red, yellow and green to indicate charge level. And then there’s the clearomizer packaged with the 134 mini. Innokin always seems to launch a new clearo every time they roll out a new APV. That trend continues with the 134 Mini. The iClear X.1 is perhaps the company’s most solid clearomizer yet. The X.1 is a bottom dual coil tank. And it’s also the first one to rock a pyrex tank. While the plastic tanks in previous Innokins are surprisingly durable, nothing beats glass if you’re favorite e-liquids happen to be acidic. What can I say? I loves me some citrus. For you VTR fans out there, I’m happy to note that this iClear actually fits within the retaining ring of the VTR, so that’s a nice plus. While Innokin has tried to change things up a bit for it’s various clearos, like the 30B, the X.1 has a slightly more subdued, yet more stylized design. There is a rather sizable logo etched along the bottom part of the tank. It’s maybe a little over the top, but it doesn’t quite stick out too much. The Pyrex tank has graduation markings silk screened on it so you can see how much liquid is placed in the tank. A nice little extra is a “max” line printed upside down on the tank. when filling from the bottom of the tank, the max line is now right side up. Like most other bottom coils on the market, the head is replaceable by removing the bottom cap and unscrewing the head. As Innokin is wont to do, the heads are different from any other clearomizer they produce including the previous iClear 30b. I suspect this may be a move to counter counterfeiting. The top cap of the iClear matches the bottom part style-wise and is also constructed of steel. 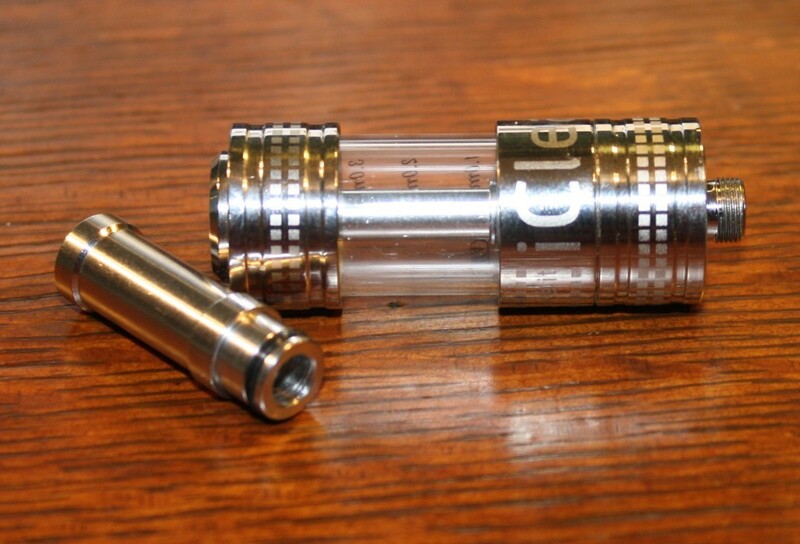 The version I received was fitted with a normal, straight drip tip. 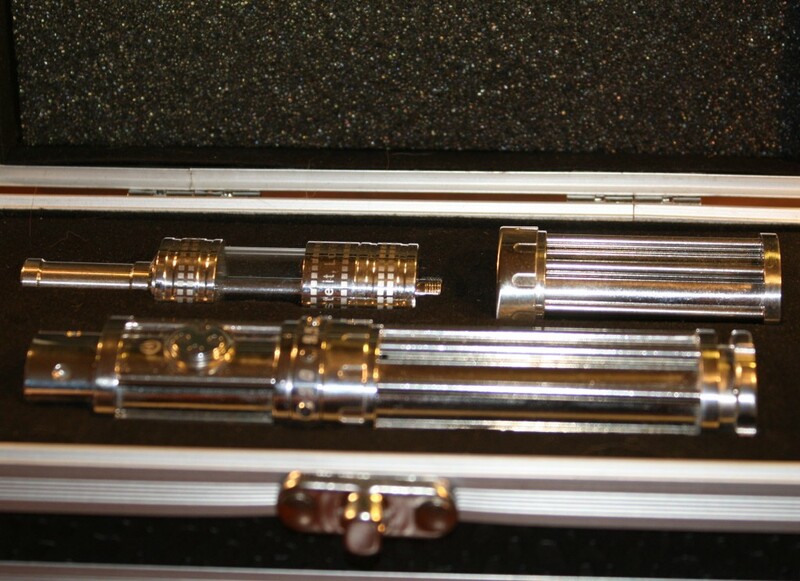 However, the rotating multi-angle tips will also work with this clearomizer. Pairing the two of these devices together really shows a good overall design aesthetic. Clearly, the two devices were made for each other. Like everything Innokin makes, the build is incredibly solid with tight engineering tolerances. The clearomizer and APV match up together nearly seamlessly. Performance from the 134 is pretty much on par with that of its big brother. Save for battery life, of course. You’re just going to have a shorter run time with shorter batteries, basic physics and all that. Otherwise, the movement on the wattage adjustment ring is a thing of beauty. The dial on this version goes up to 12.5 watts, and lacks some of the oddball increments that the larger unit has. As for the iClear, it’s perfectly happy chugging along at the full 12.5 watts on the mini. Even running this clearo on other devices that can go past 12.5 watts, I didn’t run into many problems typically associated with too much power. This thing seems to be able to handle abuse in stride. What’s even better, the X.1 has that nice crackle I used to be so familiar with in traditional cartomizer tanks. Whenever I hear that sound I just know it’s going to be a treat of a vape. I did, however, pickup an odd tactical sensation when using the 134 Mini. The control head sort of had a slight vibration going on in there. It gave the tactile sensation that the clearomizer was boiling. It isn’t a particularly problematic issue, but it is a fairly strange sensation. I’m more than willing to overlook that particular eccentricity because the performance of the iClear and 134 combo is just spot on. Everything works great across a wide range of wattage from about 8 all the way to full blast. There’s a good amount of flavorful vapor to be had. Lower wattages result in a cooler vapor, while you get a nice trace of warmth when running everything wide open. I think even though the looks of the 134 will have limited appeal as will the shorter battery life of smaller batteries, Innokin has produced a fine piece of hardware yet again. Innokin’s iTaste 134 mini is exactly what it says on the box: a smaller version of the 134. The performance is not any smaller, just the size thanks to smaller batteries. Even better, the 134 is packaged with the iClear X.1 which is one of Innokin’s best clearomizers to date. If you’re looking for a smaller APV with unique styling and great performance, this one is worth a serious look. Check out options and prices. Disclosure: I received this product from Innokin for review. This review contains affiliate links. PREVIOUS POST Previous post: Are e-Cigarettes the Problem or Solution?